Electronic Format: $199.00 New Program! Kickboxing fitness a workout program that utilizes training techniques, movements and combinations of movements from boxing, karate, kickboxing, and self defense training. The Empower Martial Fitness Kickboxing course provides the information and instructional tools required to assist a fitness instructor in the development of safe and effective kickboxing fitness classes. The versatility and flexibility of this program allows the experienced fitness professional to develop an exercise regimen tailored to the demands and expectations of almost any target audience. This continuing education home study course is offered to you in a distance-learning format. The goal of Empower Martial Fitness Kickboxing is to provide a solid base of knowledge for the development of safe and effective classes. Information and instructional tools required to properly teach movements and techniques are provided for the prospective instructor. The ultimate goal is to provide instructors with the knowledge and skills required to lead safe workouts in which each movement is utilized to the fullest extent to positively stress the body and achieve the desired exercise program objectives… a motivating, safe and effective exercise routine. Specify and clarify the difference between competitive (sport) kickboxing and kickboxing fitness. Explain the benefits associated with participation in a kickboxing fitness program. Learn to explain, demonstrate, and instruct the safe and proper execution of body position and body strikes. Identify the primary joint movements involved in each action phase of the techniques. Include lower body action into upper body striking movements and describe the benefits achieved. Discuss safety concerns associated with each movement and technique described in the course. Provide information about technique execution modifications that can be used for certain situations and environments where injury potential may be high. Develop an understanding of the concept of beginner, intermediate, and advanced levels of participation, as related to both skill and conditioning of individual participants and understand methods to adjust activity intensity to meet the needs of the participants. Create an understanding of the important concepts and factors that influence kickboxing fitness. Identify important instructional techniques, related to; 1. Progression of Skills, 2. Music, 3. CueingDevelop a clear understanding of how to evaluate, plan the use of, and use kickboxing training equipment in classes and programs. Describe the basic equipment characteristics that influence the safe and proper use in an exercise class environment. Identify desired kickboxing fitness instructor qualifications. Provide a guideline to use when evaluating potential instructor training resources. movements described within this course. establishment of class and program goals, objectives, and format design. Explain/physically demonstrate, and instruct the choreography patterns described in the course. Understand and explain the various training goals associated with the workout. Be aware of and understand the factors affecting choreography instruction. kickboxing/MMA fitness training session or class. 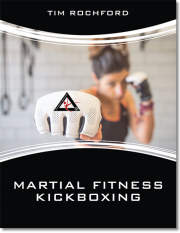 Electronic format – The Empower Martial Fitness Kickboxing certificate package with online test includes the PDF version of the 339-page Empower Martial Fitness Kickboxing manual by Tim Rochford and a 44-page workbook provided in PDF format. Also included is access to over four hours of insrtuctional video. Note: This course package is made available for immediate access and download after purchase. All materials are available electronically. Nothing is mailed.